It was so nice this week to be back into regular lessons and focusing again on the curriculum that I love so dearly! I have really enjoyed looking through and learning from the assessments (SLO’s) but I sure missed just making music with my students! This has been a great week with many new terms shared with students as well as just having fun in class! 2nd grade heard about their program plans this week and they are so excited! I was a little worried that they wouldn’t be excited to do the same book as last year’s 2nd graders did, but that actually made them more excited! They felt pretty great about themselves when I told them that I had made some changes specifically for them and it was going to be great! Their program is February 7, 2019 and we have to start now if I want to get everything taught when I only see them 2 times per week for 30 minutes each time and we have holidays in there too! It works to start this early because when I do programs, the pieces that I do are covering the curriculum and so we are still doing the things we would be doing even if we were not planning for a program! At this age, students need to be able to share WHAT THEY KNOW and WHAT THEY ARE ABLE TO DO in a program, not just “look cute!” This is a passion of mine and last year I felt great about my choices when I got parent feedback like “I had no idea my child could do all of that” or “It’s amazing how they all know what do and when to do it!” My basic philosophy for programs is that what goes on stage should be what is going on in the music room year round! So - 2nd grade will be doing Snowmen at Night by Caralyn Buehner! Last year I wrote 8 modal pieces for the different things the snowmen do at night and accompanied them with simple accompaniments that 2nd grade could do based on where we were at in the curriculum! My 2nd graders don’t know the pieces are in modes and they don’t know the names of the modes because they don’t have to! But they do get to hear lots of different sounds that make them feel differently about each sound! Last year, students remarked that the Phrygian piece sounded kind of “eerie” and their favorite sound was the Dorian piece! (The Dorian one is my favorite too!) . Recently I put all of these pieces and other suggestions for using this book as a program on my Teachers Pay Teachers store! Check it out if you are interested! You can hear my students singing one of the pieces (“Snowman Races” in Mixolydian) in the video to the right of this post! We’ve just started it so this is lesson 2 but they have picked up on it very quickly! I used a new technique when I taught this song last year and I’ve loved it so I did it again this year! I show them the text on the Smart Board and then play the melody on my recorder and they have to see if they can fit the text to the tune they hear! Once they’ve heard it one time, I start again but stop somewhere in the middle and they have to tell me what word I stopped on! I do this 4-6 times so they are getting the melody in their ears but they are also working on their reading skills, as well as making the connections between rhythm and syllables! They have learned it quickly this way! 2nd grade behavior was also great this week because they are so engaged with this material!! 1st grade worked on locomotor movement this week! We discussed the words ‘locomotor’ and ‘traveling’ and then students named what they thought some locomotor movements would be! We looked at the locomotor words on the Movement Word Wall and found the words that were suggested by the students and I pulled 6 of them off and put them up front! So this week we focused on walk, run, skip, hop, gallop, and crawl. We then learned the song “Circle Travel Game” which is in the American Edition of Music For Children Volume 1 and we played the game. I adapted the game a bit to work for my situation! Before we start the game I show them xylophone bars on the Smart Board and we talk about our C bordun and find it on the Smart Board. We practice singing the song and patting the steady beat to prepare for the xylophone part when it comes! For the game, I have them sit in a circle and the “IT” student goes around the outside of the circle “Air Tapping” students’ heads (We don’t actually tap on the heads - just the air above their heads :) while we sing the song! Whoever they land on for the last word of the song (“go”) stands up and chooses one of the locomotor movement words that we have displayed in the front of the room and performs that movement around the circle while the “IT” follows them and copies their movement and the class sings the song. The class then names the locomotor movement that the “IT” child performed. After following the new “IT” around the circle, the old “IT” goes to the BX and plays a C bordun on the steady beat! Once a student is at the BX, they will stay and play 2 times. Once while 2 students are moving around the circle and once while the new “IT” is “Air Tapping” around the circle! You can check out a sample of this on the video to the right of this post! Kindergarten is celebrating fall this week with “Pumpkin Stew,” which is a song I have done for MANY years! Originally I got it out of the Share the Music textbook by McMillan McGraw-Hill about 20+ years ago! I made it into a game similar to the game that 1st grade played this week! The “IT” goes around the outside of the circle “Air Tapping” other students on the beat while we sing the song. Whoever the “IT” lands on at the end of the song (“stew”) tells what they would like to put in our ‘Pumpkin Stew’ and they come up with some crazy things! 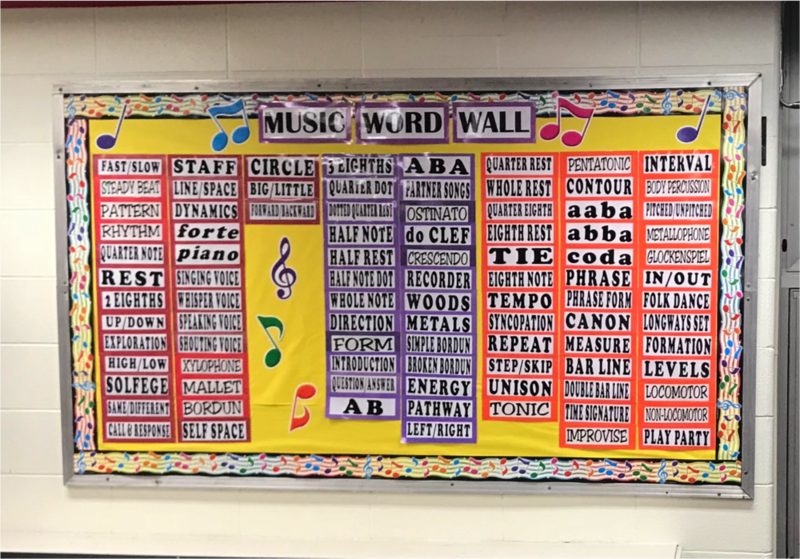 I list their suggestion on the board and then that student now becomes the new “IT” and the old “IT” goes to the BX and plays the G bordun on the steady beat! I do NOT talk about borduns with Kinders at this point and I take off almost all the bars except for G & D so they really can’t miss them! They love the “game” element and they love playing the BX one at a time! And then of course I have the chance to assess their steady beats! 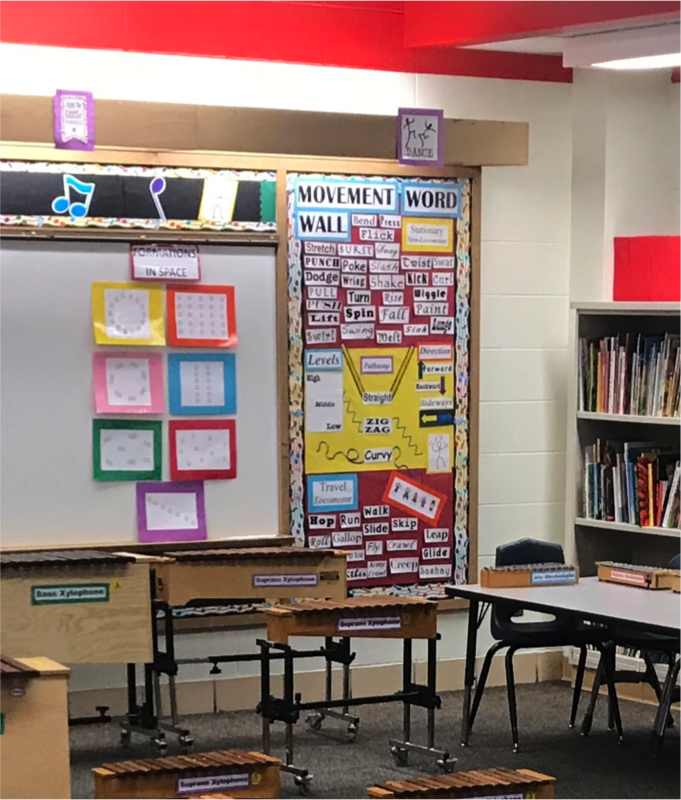 School has been so joyful this year and part of it is the darling kiddos that I teach and the other part is because I’m so much more organized and focused on my curriculum this year! It is such a blessing to be where I am 30 years into teaching!